True Wind is the sailboat’s fuel supply. Of all the functions that an instrument system produces, wind functions are the most important for performance, tactics and strategy during racing. Tacking onto the favored board when the wind shifts is worth something like 7 seconds/mile per degree of shift. However, tacking incurs a penalty (about a boatlength to weather), so the potential gain must be balanced against the cost. Is the shift big enough and will it last long enough to pay off? See Tack Analysis for more detail on this subject. When the cost of tacking will not pay off, or if the tactical situation precludes it, wallying on the same tack gains to a lesser extent, and moves lateral position so when the wind shifts back, you lose less to those ahead and gain more on those behind. I think of Wally like day trading stocks. You just move to cash before swinging from long to short. VMC sailing is more like an option straddle where the option premium could be considered infinity small. The goal is to profit from volatility. In VMC sailing, you can control the level of risk relative to the fleet. The level of risk can be so small relative to the potential gains. You are in control. In the attached slide the level of risk/reward is shown as the size of the zones. Wouldn’t you take a bet when the deck is stacked 10:1 in your favor? There are times when much faster boats have beat over my weather hip. 12 hours later they beat over my other hip. The point is that in the Great lakes things occur in a random fashion that the grib [optimal routing files] doesn’t reflect. See Sailing in the Real World for more on these subjects. The longer term wind direction provides a clue about which side of the course to go for on the next leg. The best way to determine this is via a stripchart (works with all systems) or the stats function of the T1. Wind shear is always present, and when recognized, calms the savage breast, provides insight into sail trimming and possible future wind shifts. One of the first hurdles new instrument owners have is understanding and then using this natural phenomenon. Not knowing how many minutes to the layline, or whether you’ve overstood has lost an awful lot of races. The Ockam system provides three functions to help prevent this situation: Laylines, Opposite Tack and Waypoint Range & Bearing. 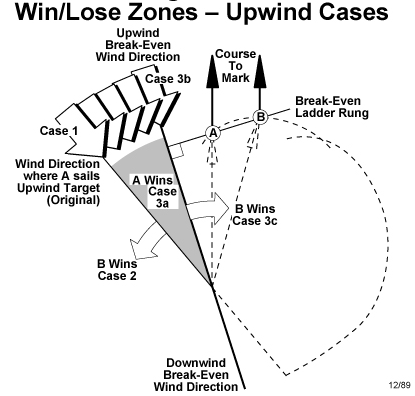 Wind direction is one of three inputs (the other two are waypoint range & bearing and target angle) required to calculate laylines. Having true wind, next leg rhumbline and a polar lets you calculate what sails to get ready, and where to put the pole. For a narrative on how to use Wind Direction to get more performance out of your boat, read the Ockam U page and the various scenarios described on the real world sailing page. Wind direction requires boatspeed, apparent wind and heading. is the ‘tachometer’ of the boat’s engine. True wind speed is one of the components in the solution of the wind triangle. True wind speed is a primary input for polars and targets. Sails are best characterized in true wind speed terms, so knowing it helps in sail selection. True wind along with wind direction, polars and the bearing of the next leg lets you predict next-leg apparent wind and prepare properly for sail changes after rounding. True wind speed requires boatspeed and apparent wind.